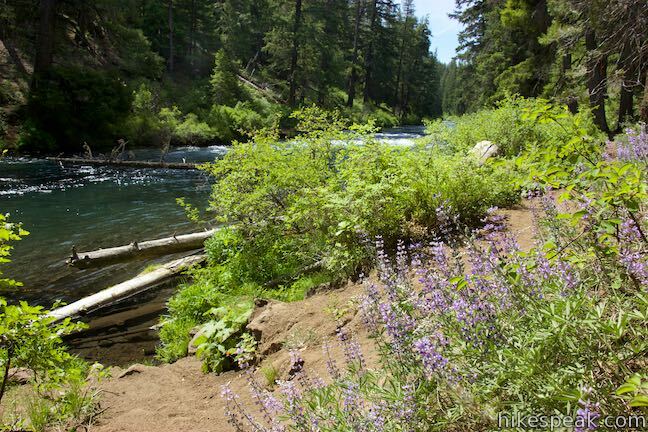 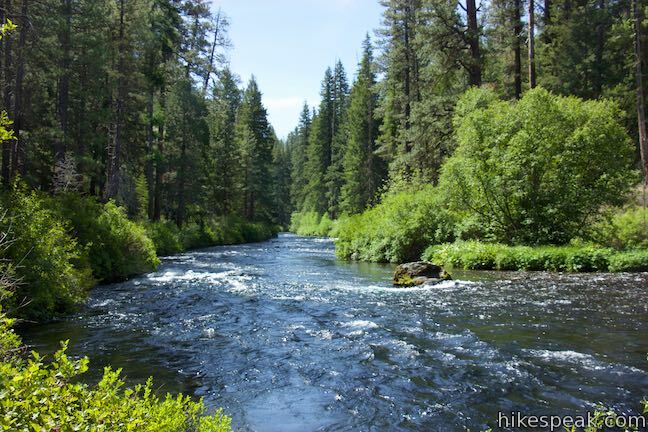 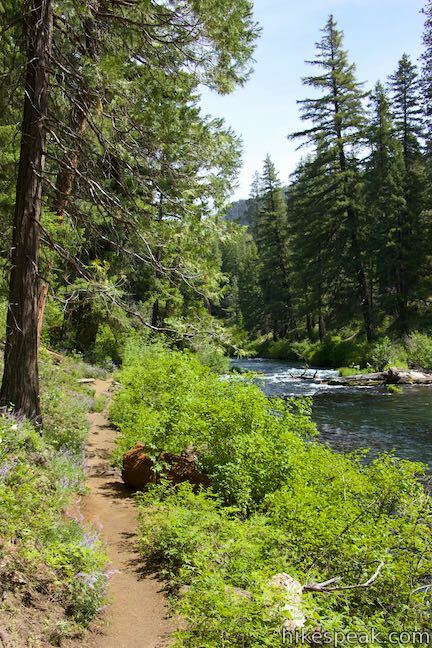 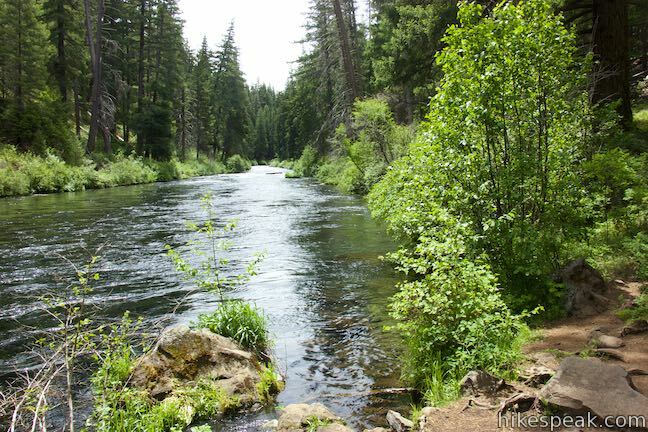 For a relaxing and fascinating hike in Central Oregon, take an easy stroll along the Metolius River. 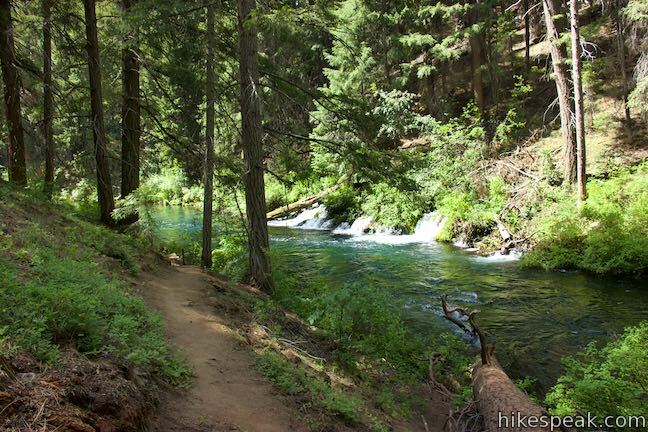 Leaving Lower Canyon Creek Campground, West Metolius River Trail quickly passes fantastical springs where water gushes from a riverbank. 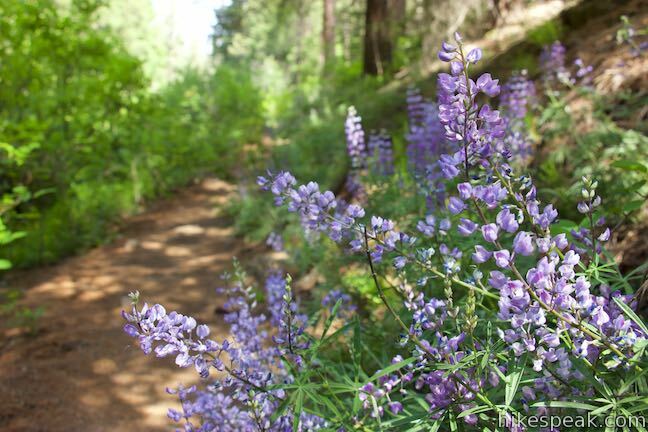 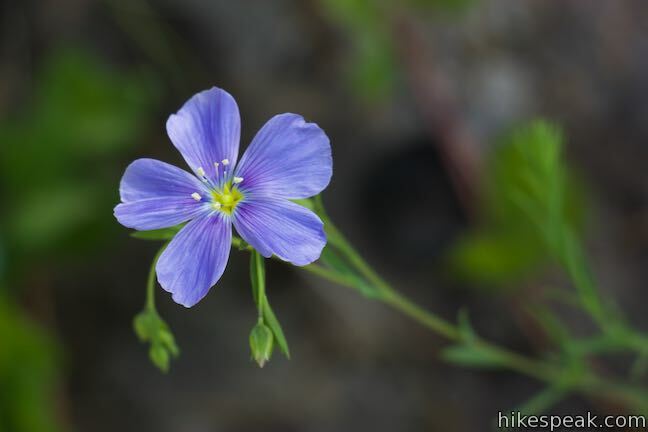 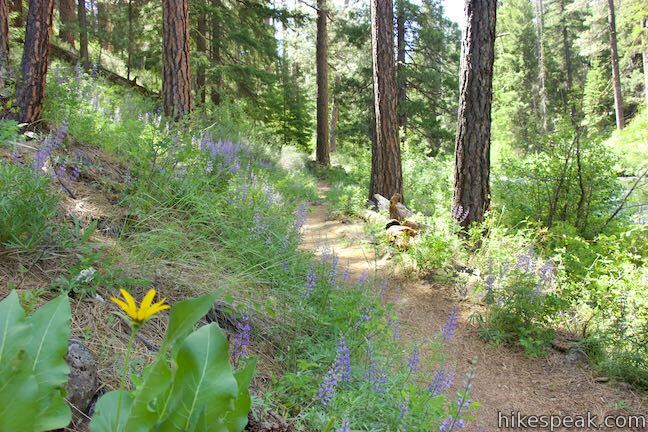 Summer wildflowers line the dirt single track as you continue downriver past calms and rapids. 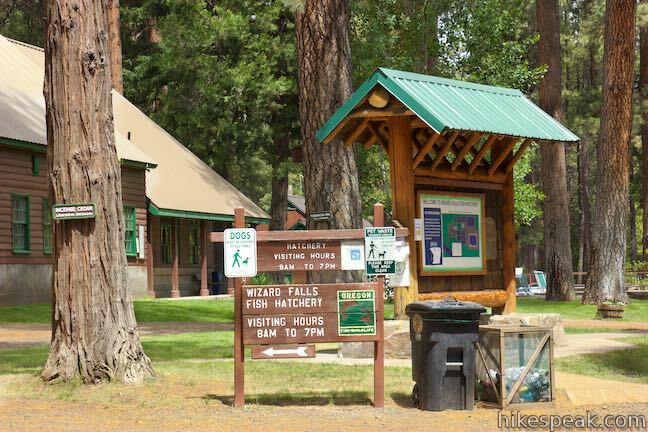 Follow the lovely river for 2.5 miles to Wizard Falls Fish Hatchery, which hikers can explore before turning around for a 5.4-mile round trip hike with 100 feet of elevation change. 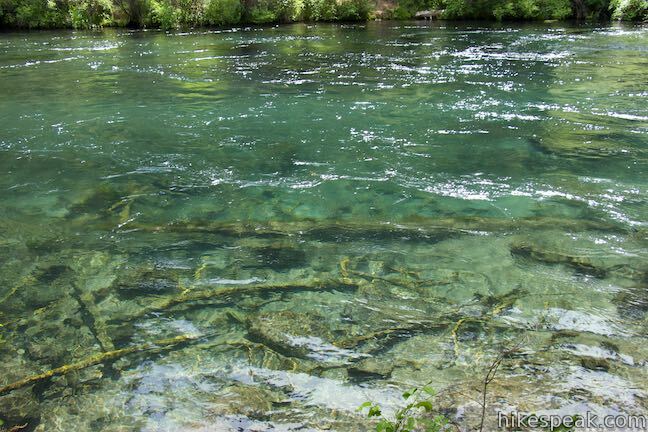 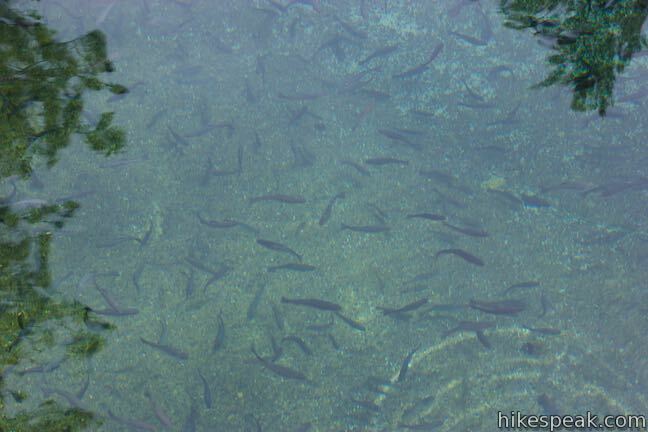 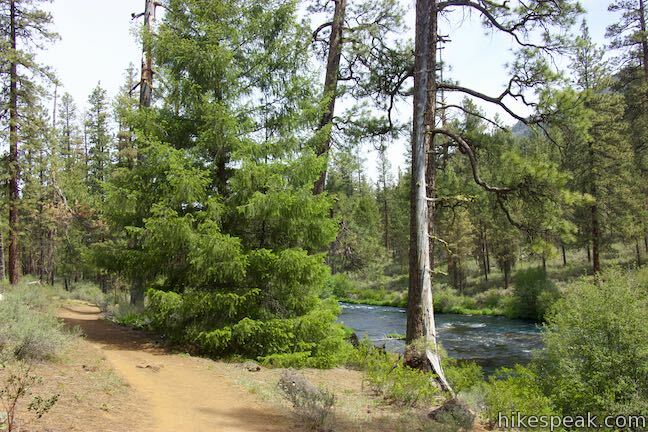 West Metolius River Trail is shaped like a fishhook, which is very appropriate for a trail to a fish hatchery. 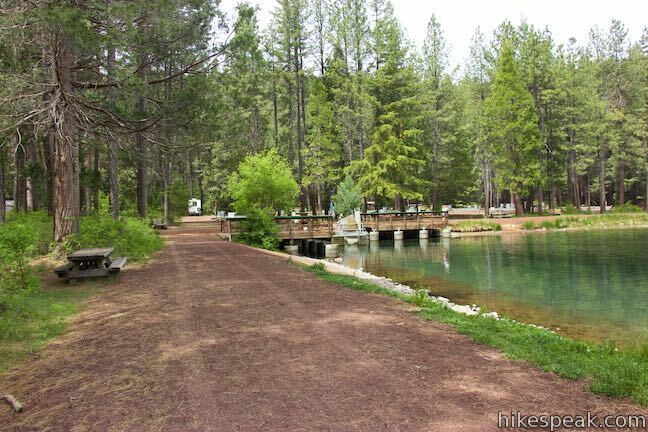 Parking is available at both ends of the trail, at the fish hatchery and campground. 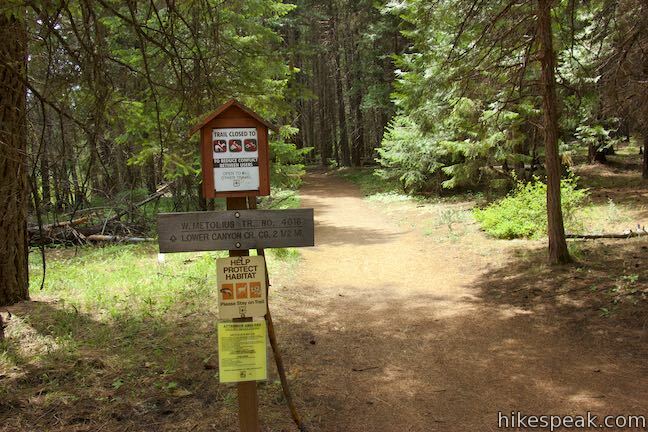 These directions start from the sharp end of the fishhook at the southwest end of the trail by Lower Canyon Creek Campground. 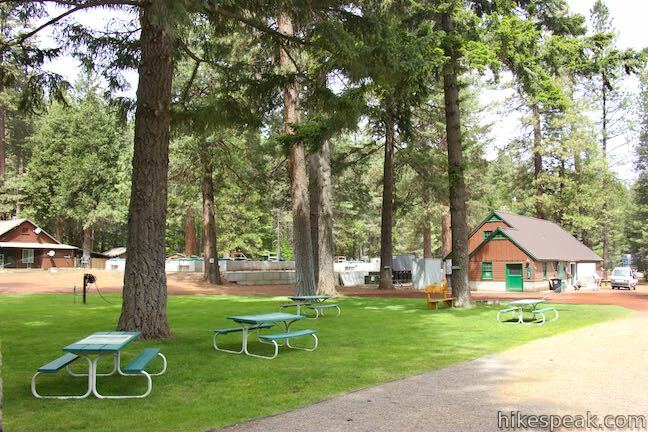 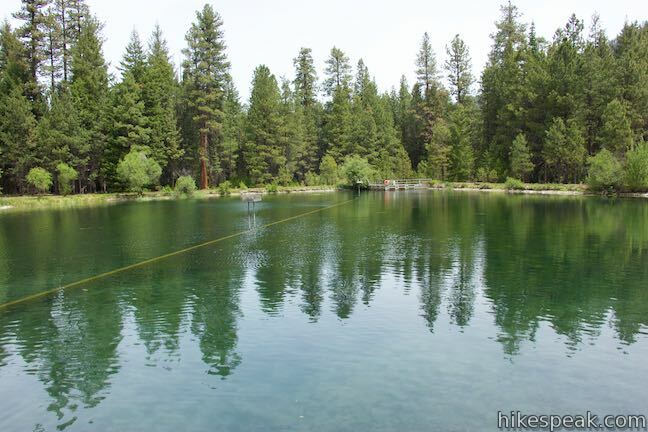 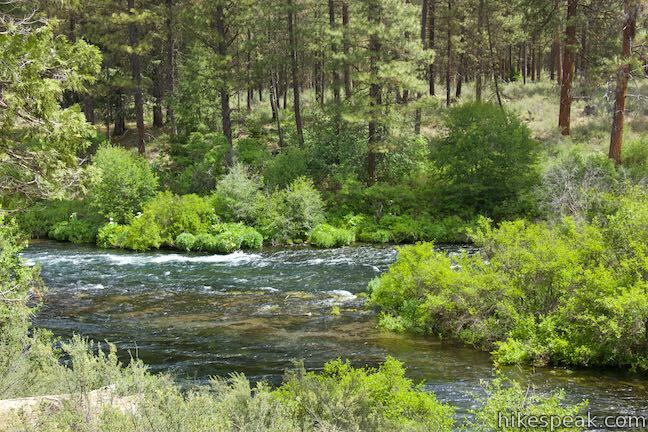 The campground sits beside the confluence of Canyon Creek and the Metolius River. 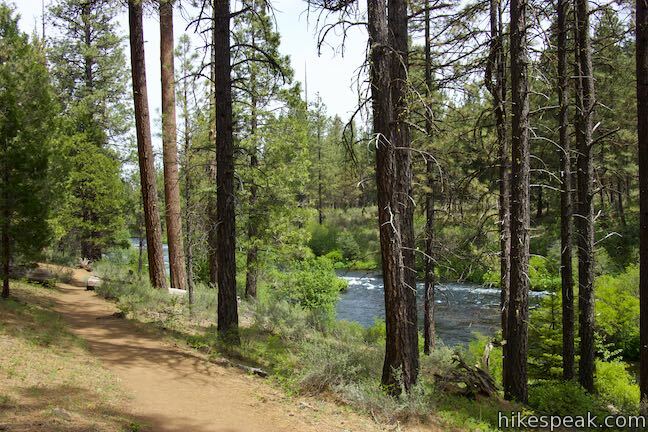 The trail goes east alongside the Metolius River, heading downstream toward a large bend. 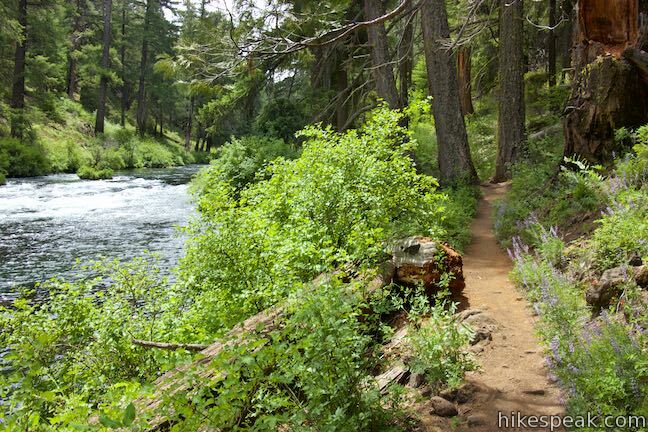 A ridge running from north to south bows the river and sends the trail on a U-shaped path. 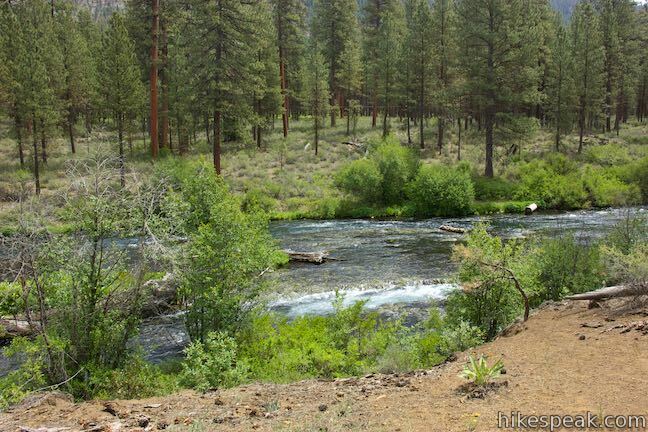 Approaching the south end of the curve, a third of a mile from the campground, you will pass something quite extraordinary. 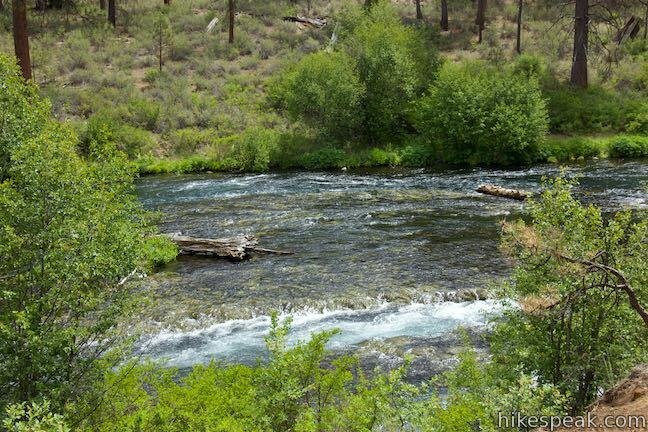 As though by magic, water pours from the brush on the opposite bank of the narrow river. 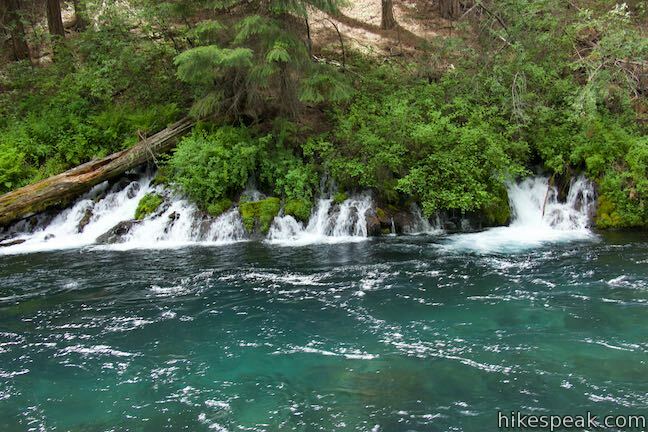 The water energetically gushes out of the ground and tumbles into the river. 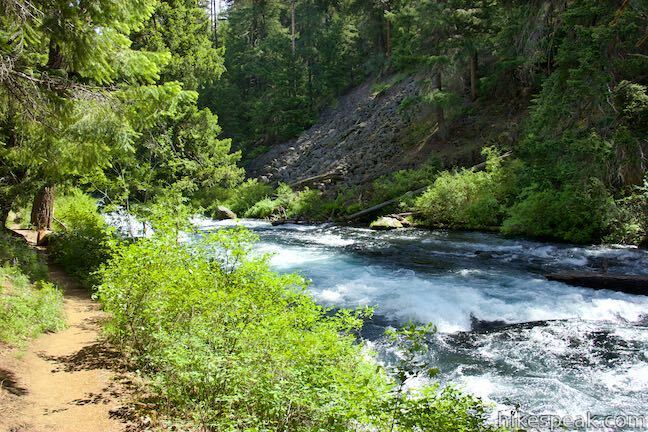 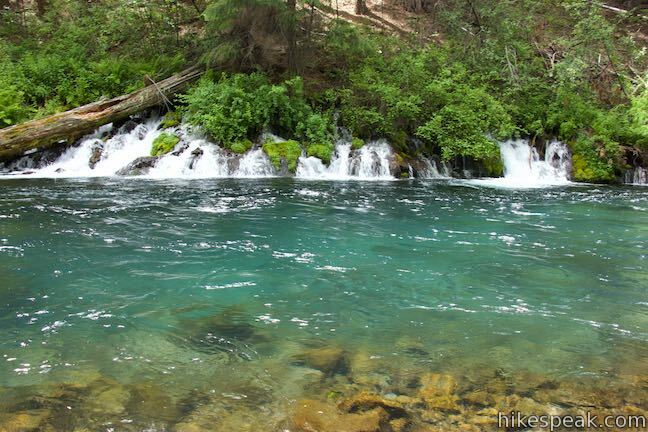 Like the nearby Head of the Metolius, where the river is born from equally impressive and unexpected springs, the springs on the bank of the river are believed to spout water sourced in the Cascade Mountains. 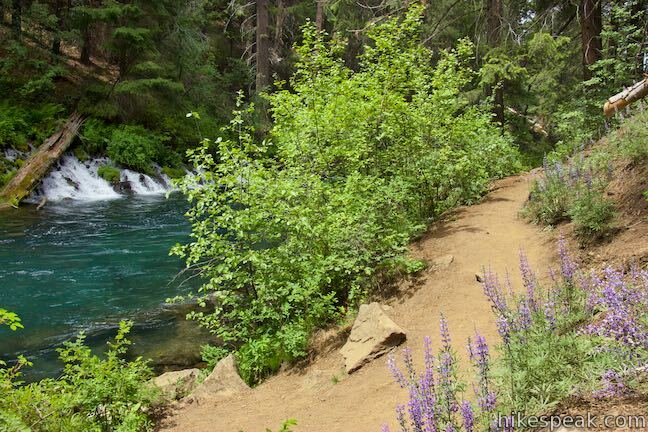 Leaving the gushing springs, West Metolius River Trail rounds the south end of the bend and heads north, following the flow of the river in this direction for the duration of the hike. 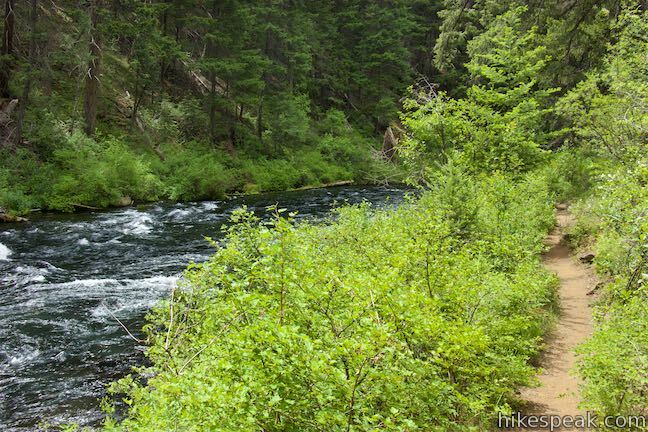 The trail clings to the bank of the river. 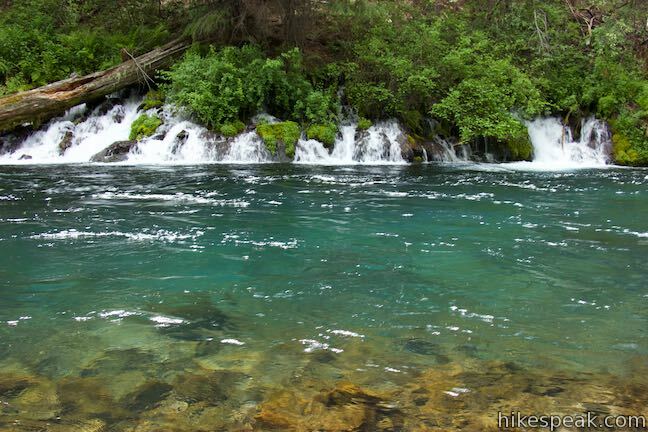 Half a mile from the start, you’ll pass an area where the swift clear blue water is broken up by white rapids. 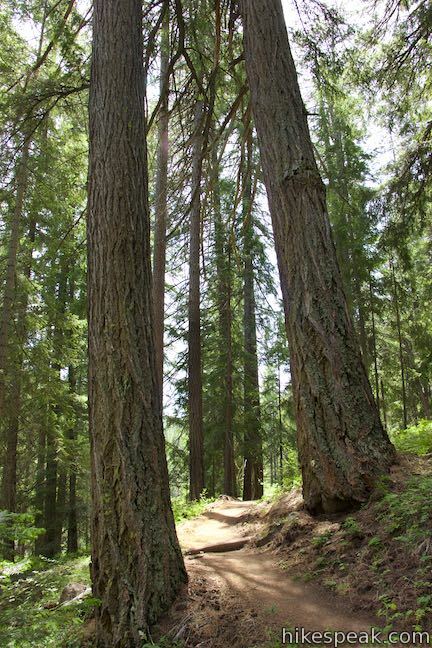 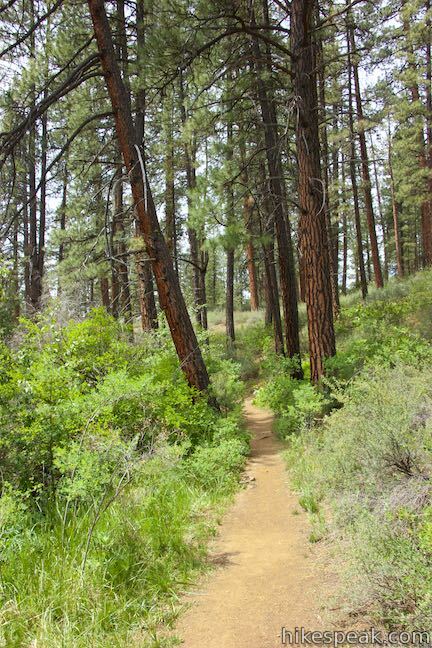 Tall incense cedars and ponderosa pines rise over the trail, letting in sunlight that is enjoyed by spring and summer wildflowers. 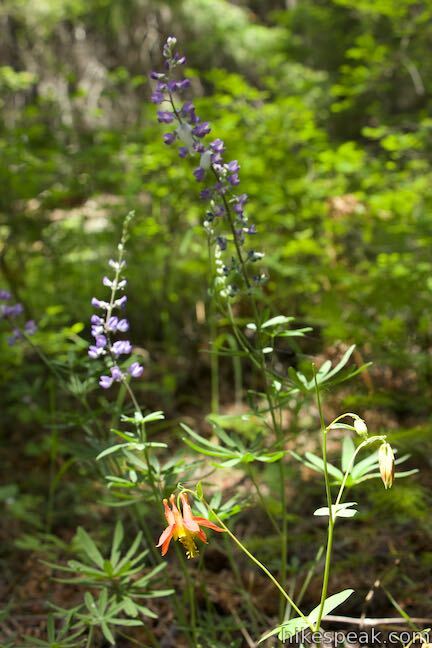 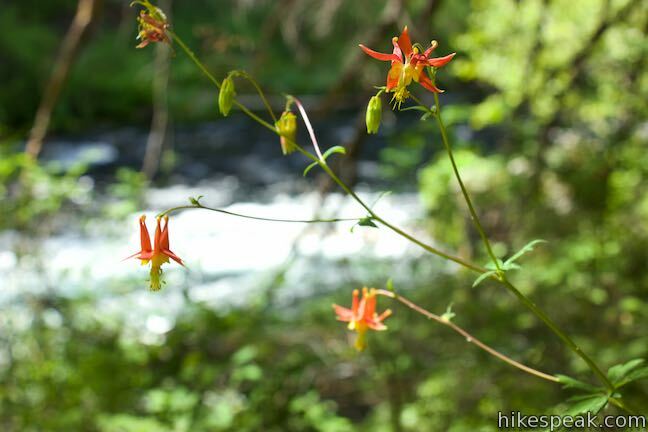 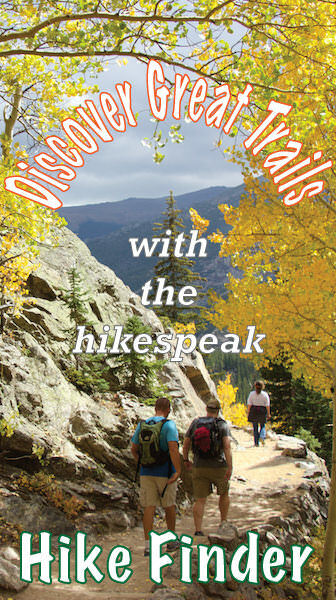 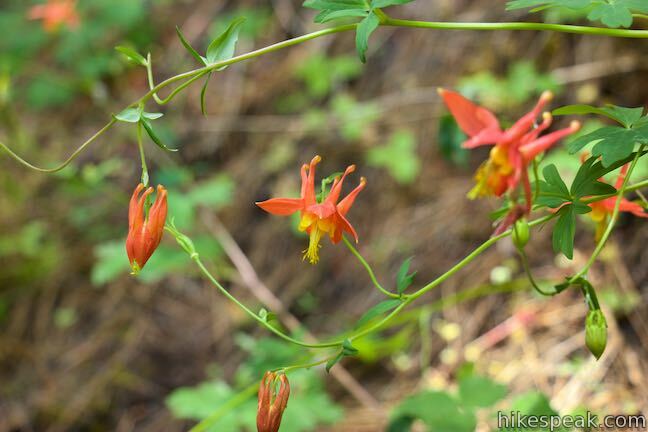 Lupines are abundant along the trail and columbine add additional flashes of yellow and red. 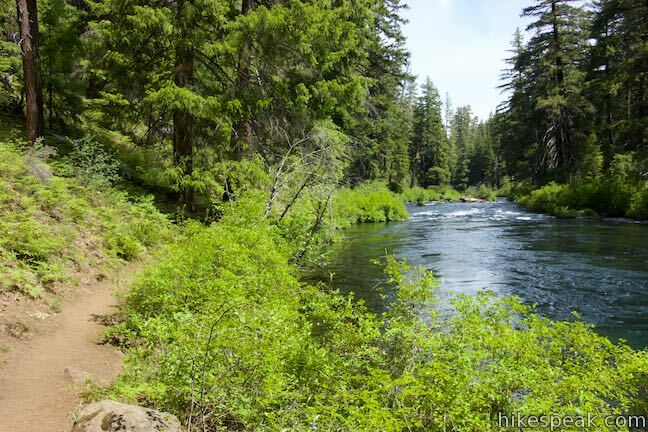 Just beyond the one-mile mark, the trail heads uphill and separates from the bank of the river. 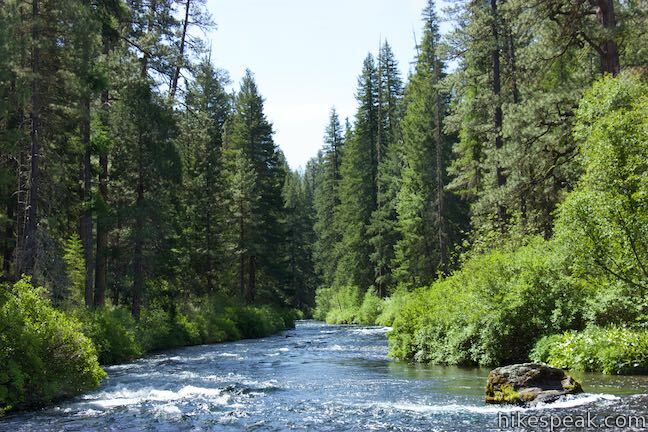 Pass through forest on the hillside above the river. 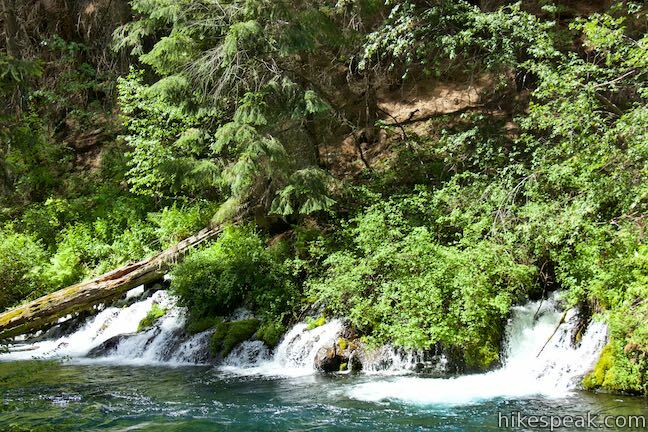 After 1.5 miles of hiking, a spur on the right descends to a ledge overlooking rapids in the river where it cuts through cliffs of volcanic rock. 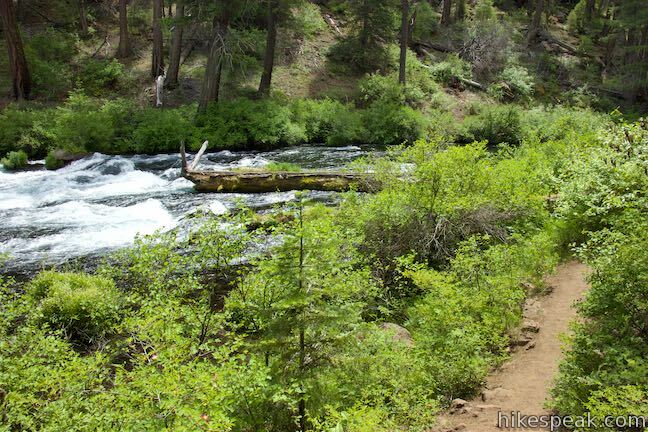 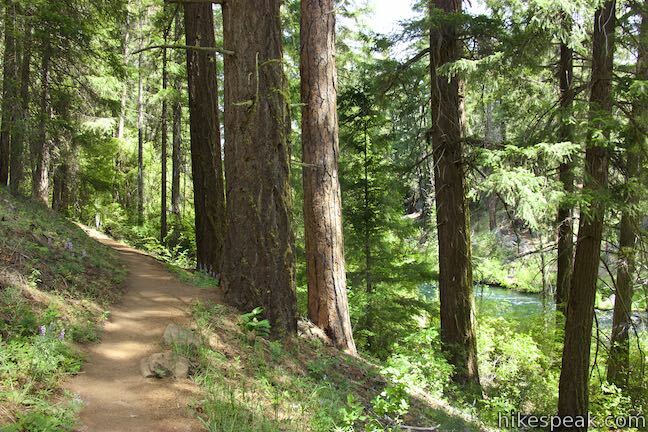 Continuing down West Metolius River Trail, the terrain by the river becomes more level and you will pass through sunny openings in the forest. 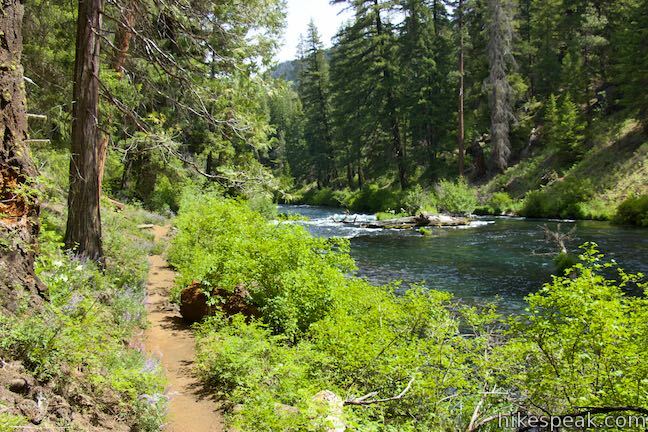 The trail runs closer to the river again. 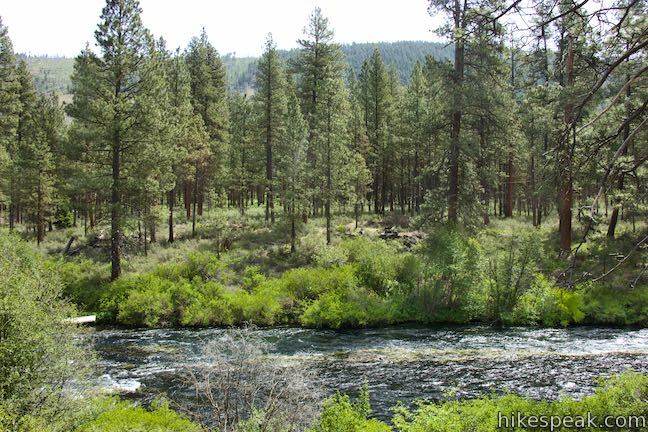 As you walk along the bank, 1.75 miles from the campground, you’ll begin to pass a series of brush-covered islands that split the river. 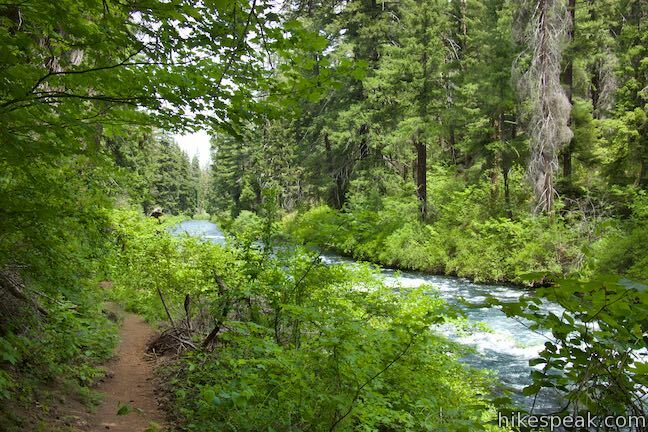 The trail strays from the river again, taking you into the forest. 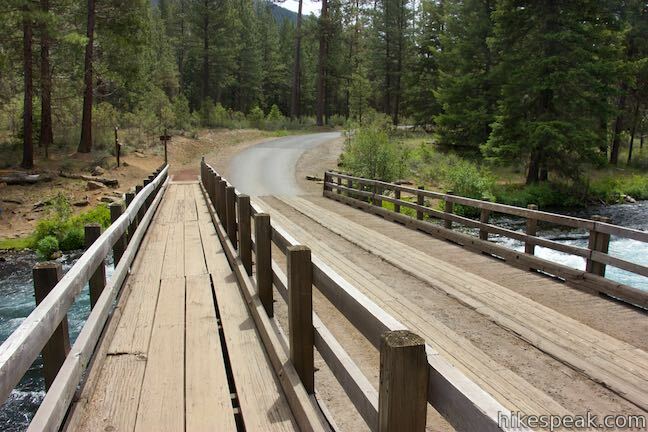 In the last half-mile, there are two wooden footbridges over trickling streams. 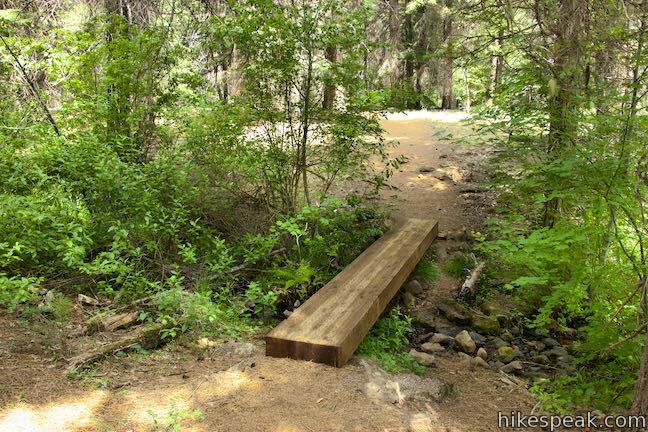 In between the bridges, you’ll pass a sign at the edge of a Safety Zone where hunting is forbidden (apparently, the trail was in an unsafe zone for the first 2 1/3 miles) as well as a sign that reads “Hiker Trail.” After the second bridge, it is a short walk to the north end of the trail, which meets a forest road at the entrance of Wizard Falls Fish Hatchery. 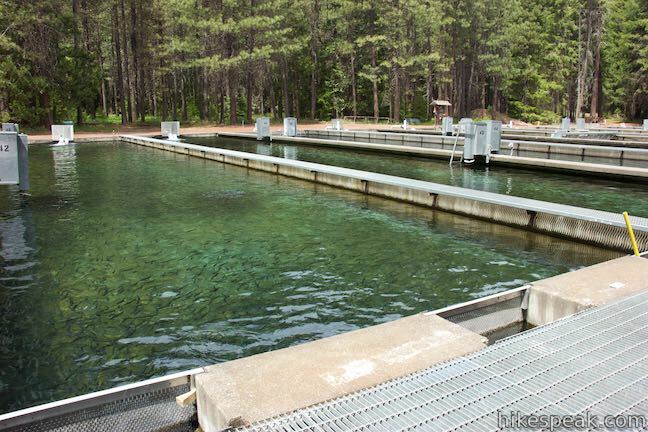 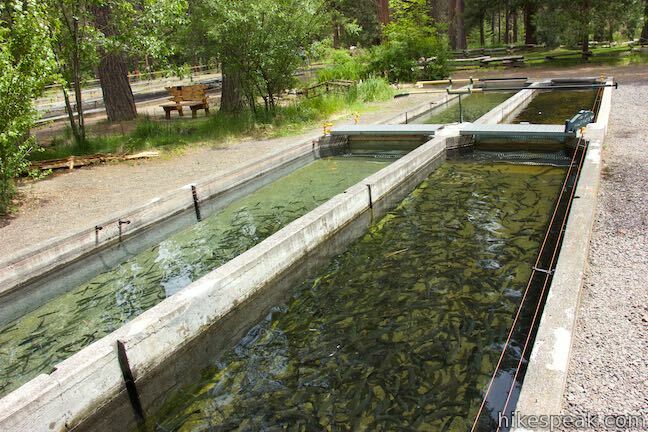 Raceways can be used for multiple fish raising purposes such as raising large groups of fingerlings (up to 300 thousand) or rearing fingerlings for an additional year to catchable size fish (8-10 inches). 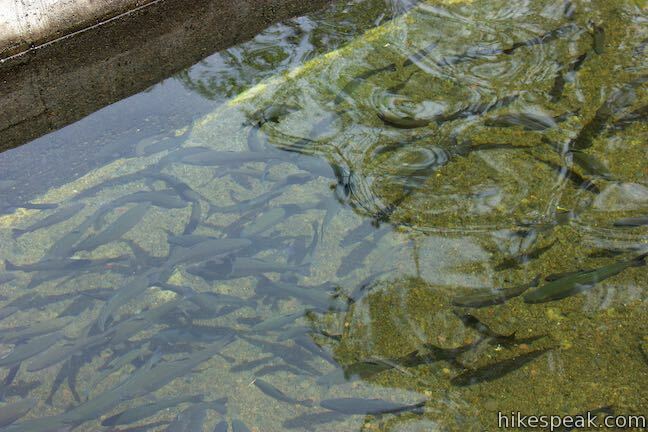 Cold water (44 degrees) or warmer water (51 degrees) can be supplied to these ponds to speed up or slow down fish growth. 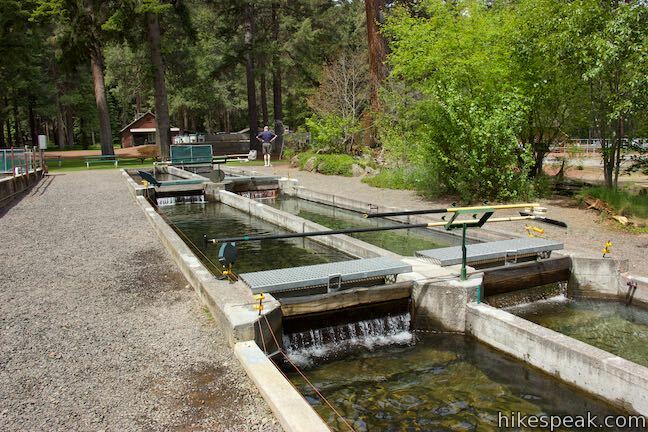 Conservation hatchery programs raise fish, primarily salmon and steelhead, to help boost declining native fish populations. 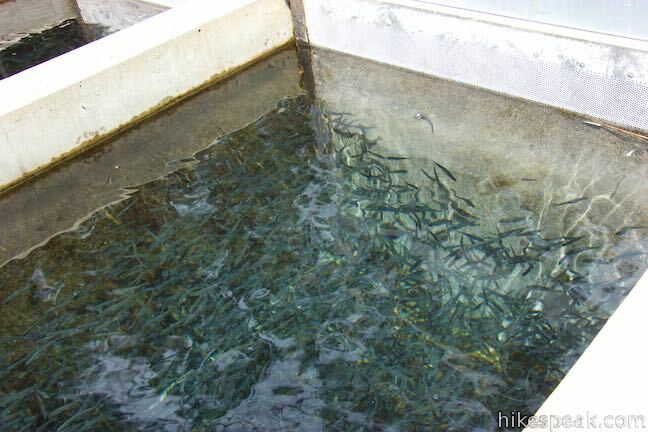 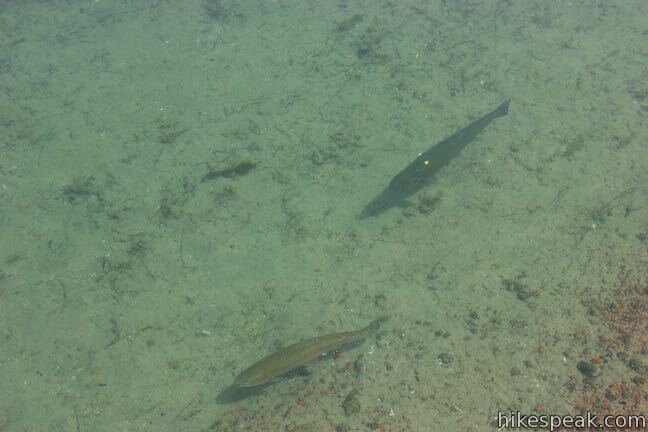 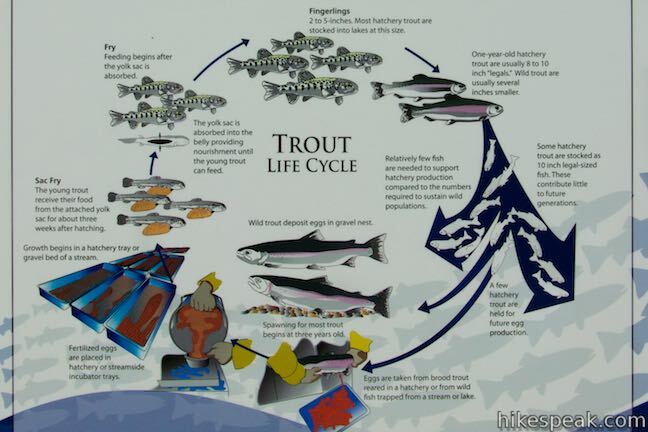 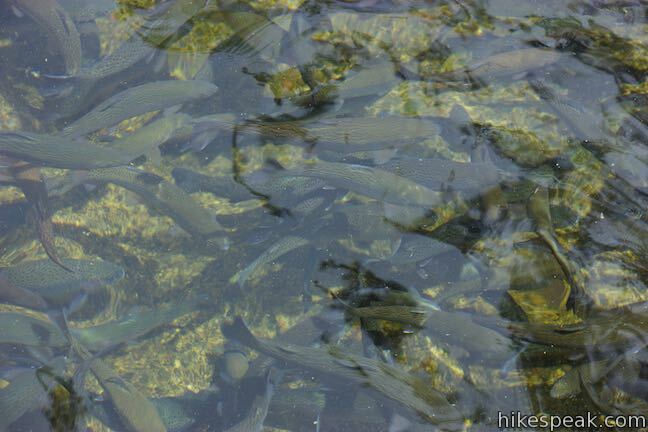 For example, hatcheries can collect eggs from wild fish and raise them in a protected environment so that more survive. 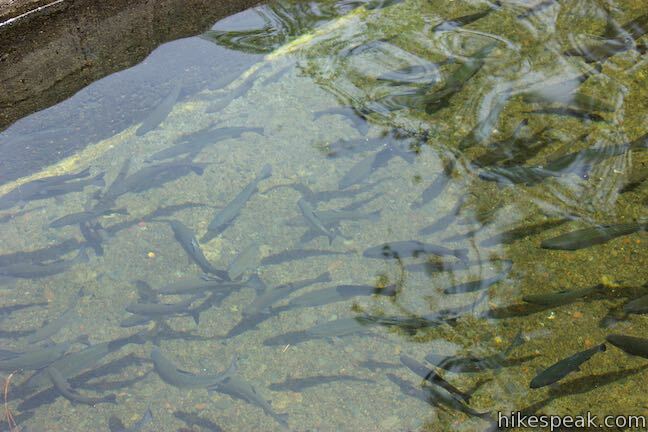 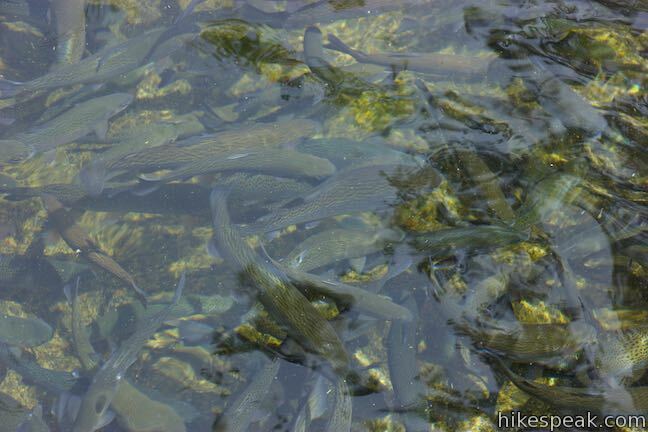 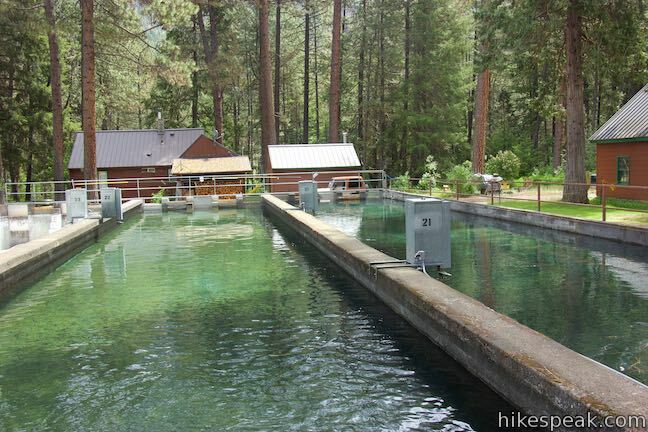 Hatcheries also play a vital role in re-introducing fish to areas where they have disappeared, such as restoring salmon or steelhead populations above dams. 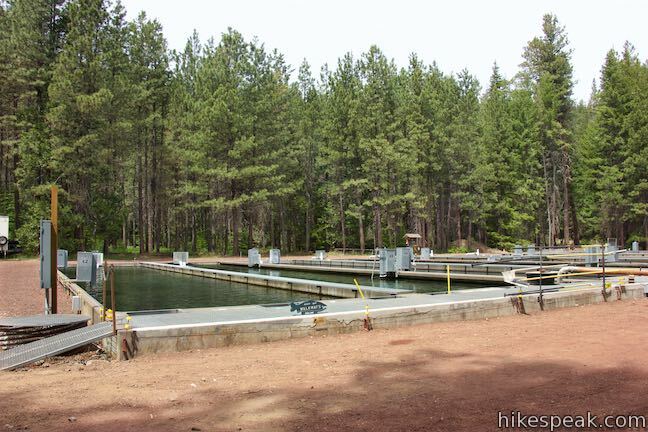 Walking through to the north end of the hatchery and you’ll find a large settling pond with docks allowing you to look down on fully-grown fish. 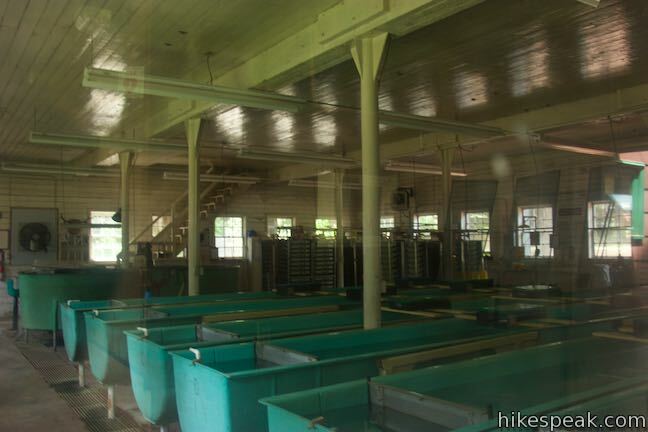 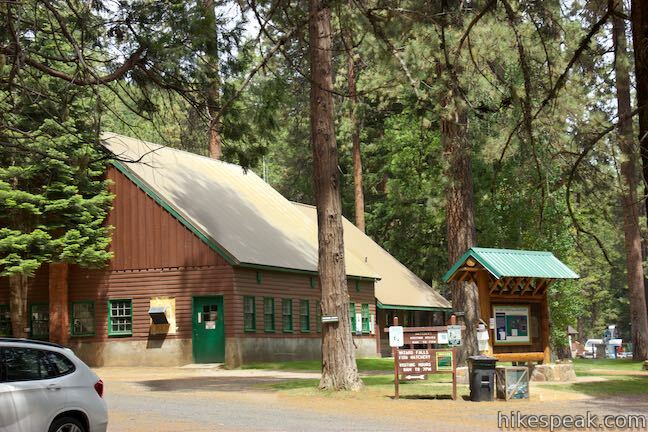 The hatchery also has picnic sites and bathrooms, making it an inviting stop for visitors. 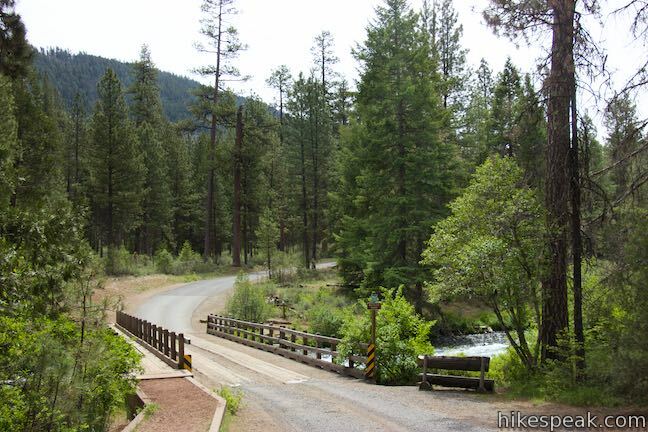 If you venture down the road at the end of West Metolius River Trail away from the hatchery, you’ll come to a bridge over the Metolius River. 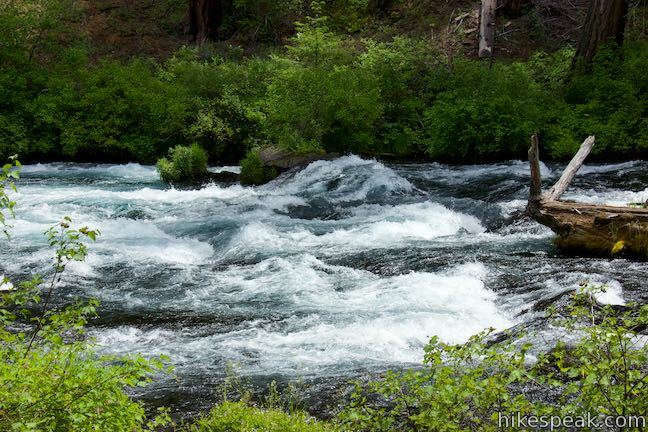 Just above the bridge, the water flows over a v-shaped shelf that creates interesting rapids. 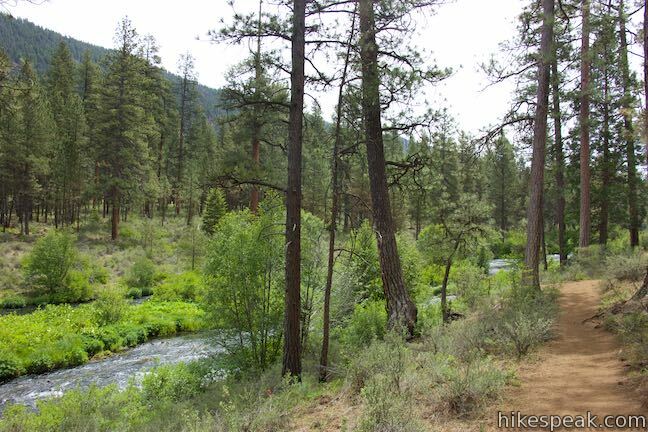 On the opposite side of the bridge, trails go up and down the east bank of the river, allowing for possible hike extensions. 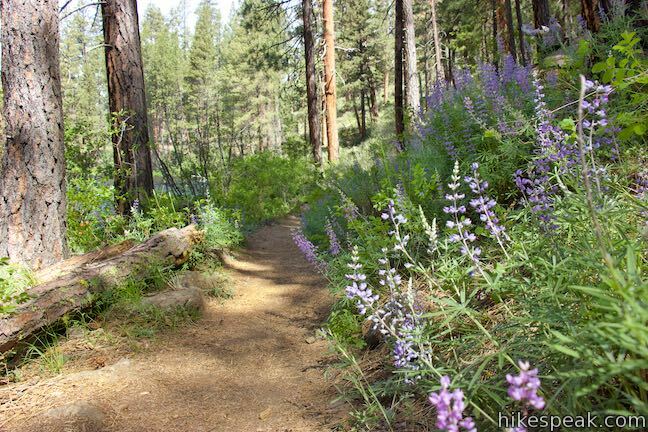 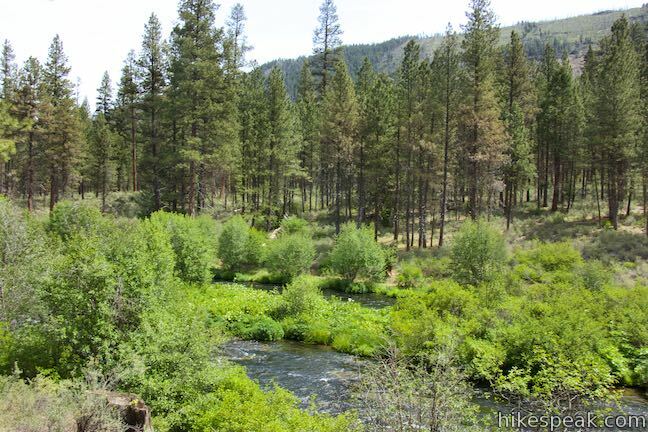 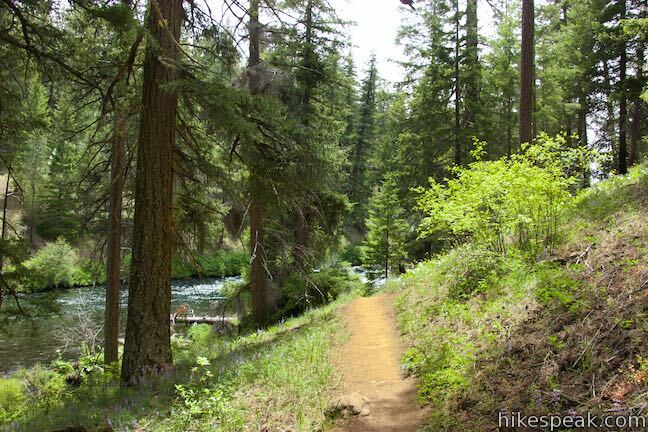 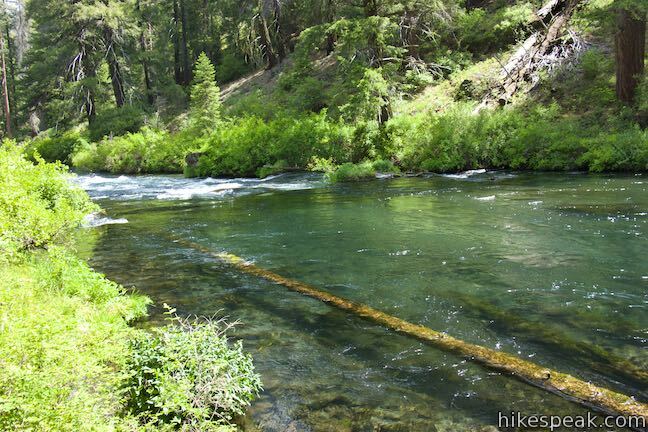 Hike back the way you came on West Metolius River Trail for a 5 to 5.5-mile round trip outing with 100 feet of elevation change. 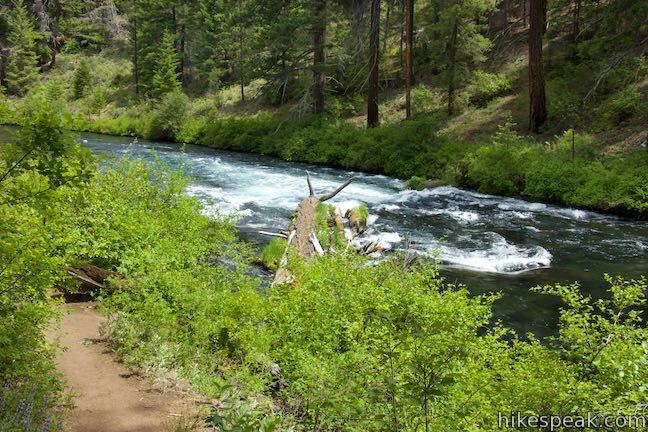 Dogs are welcome on leashes on this trail, but bikes, horses, and vehicles are not allowed. 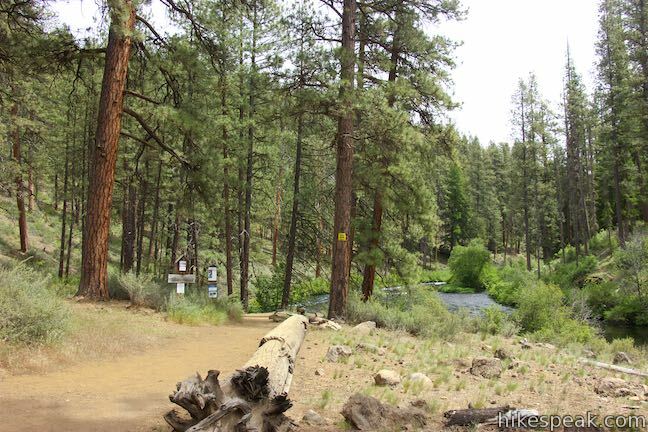 While fees are required to stay overnight at Lower Canyon Creek Campground, there does not seem to be any fee to park at the trailhead within the campground to hike West Metolius River Trail (no. 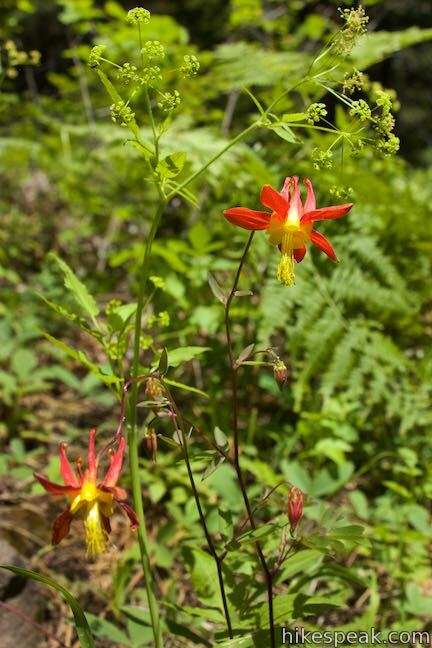 4018). 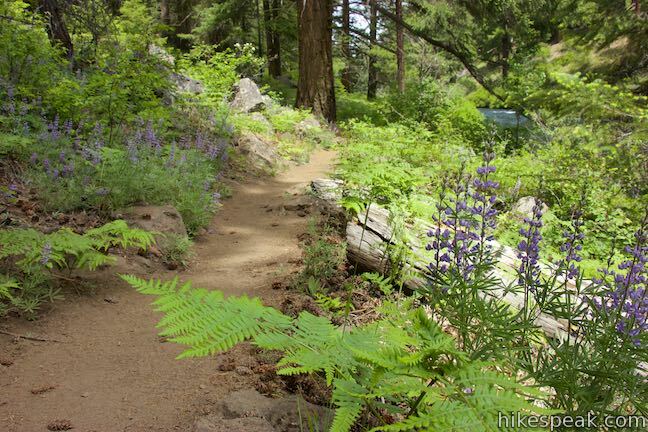 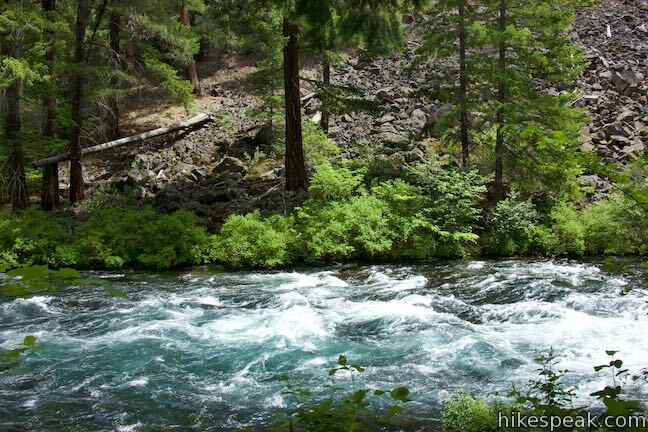 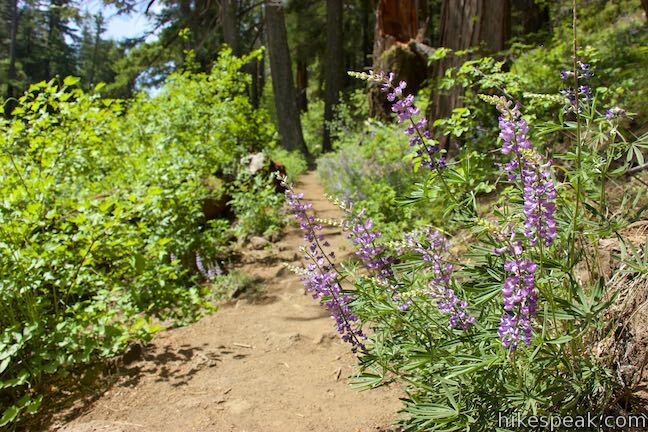 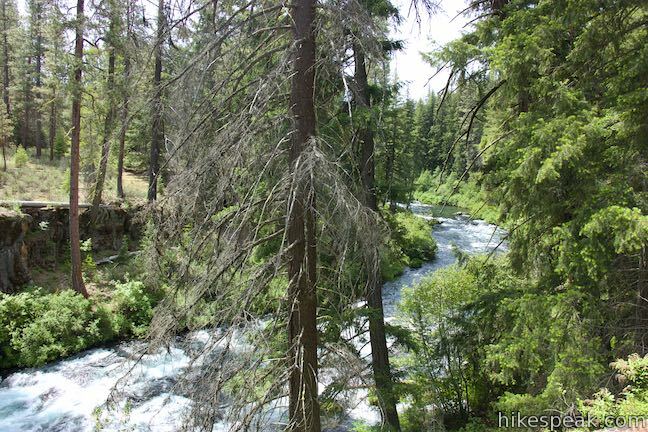 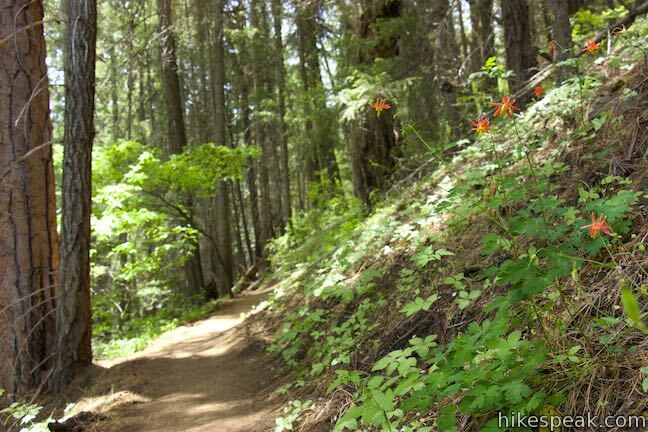 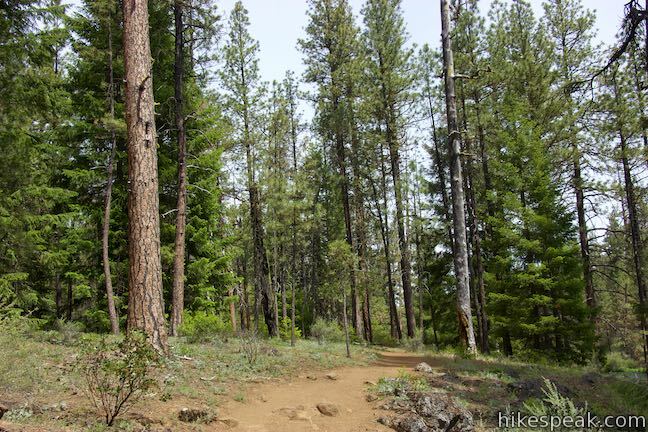 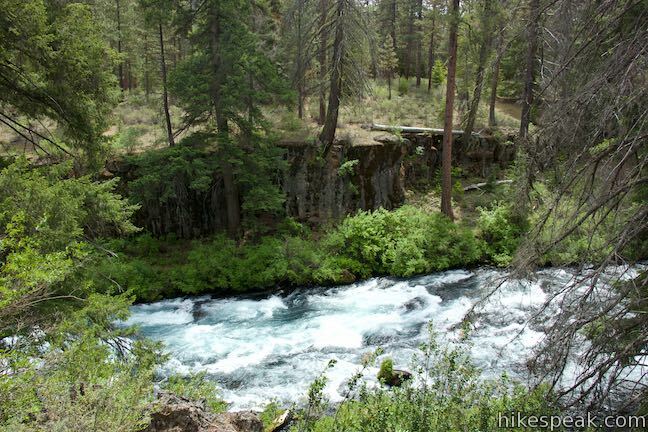 No permit is required for this hike in Deschutes National Forest, so get out and enjoy! 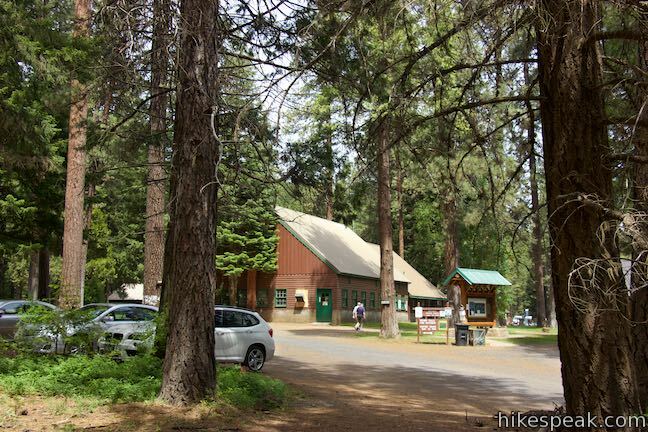 To get to the trailhead: From Sisters, drive northwest on Route 20 for 9.5 miles. 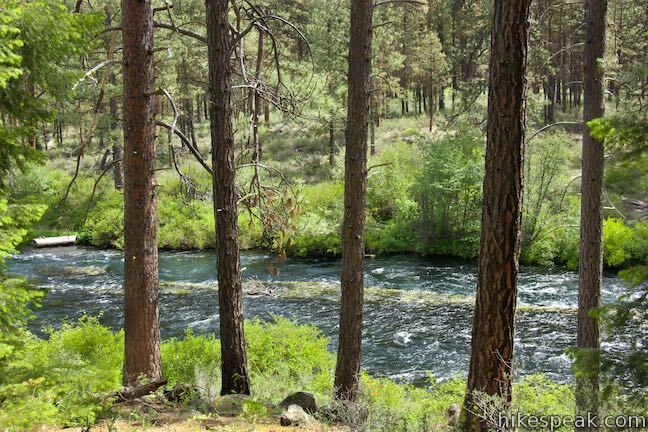 Turn right onto Camp Sherman Road and drive 2.7 miles to a split with Metolius River Road. 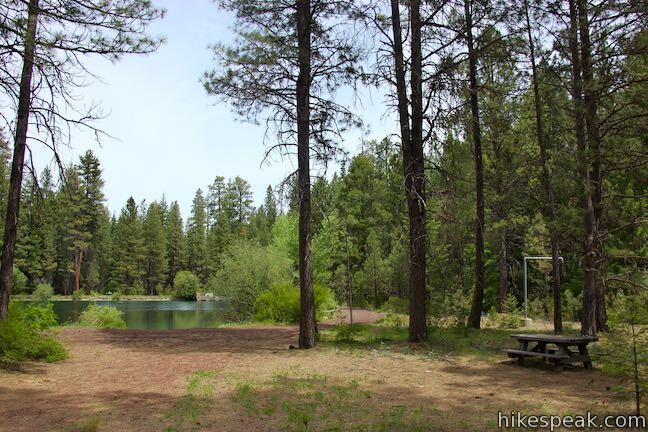 Bear left to stay on Camp Sherman Road (Forest Road 1419). 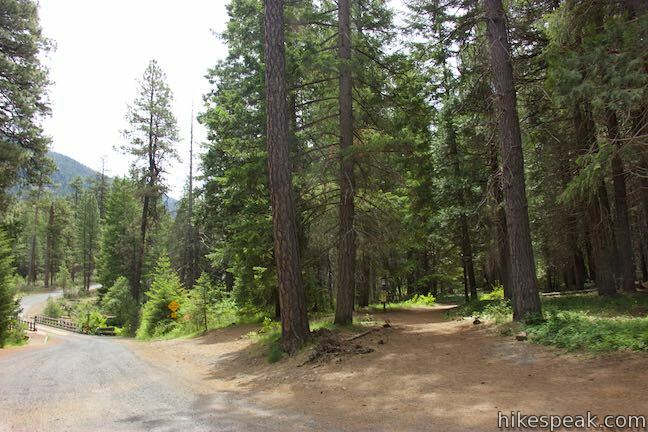 Drive 2.2 miles to a stop sign and continue straight onto Rankin Road (Forest Road 1420). 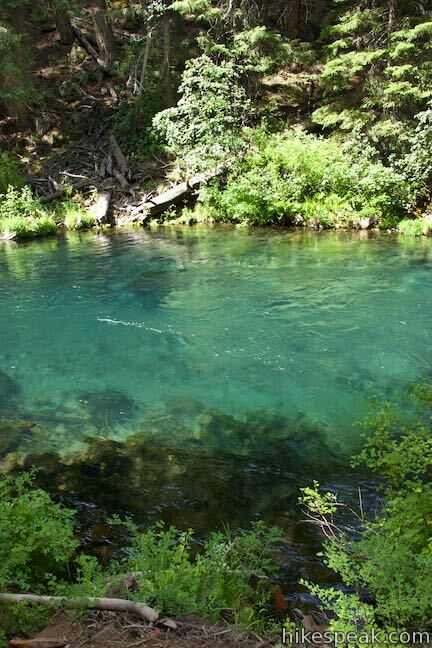 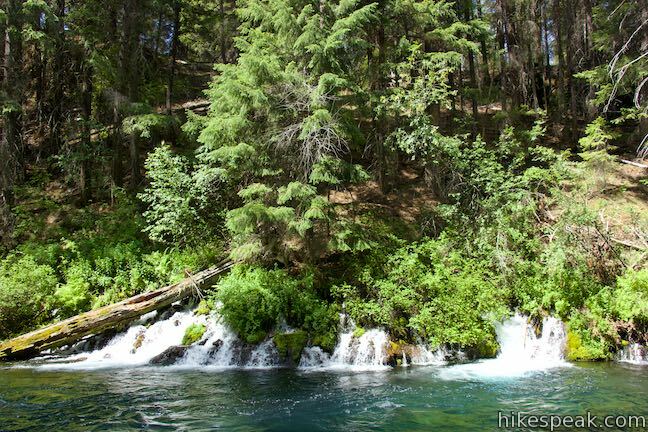 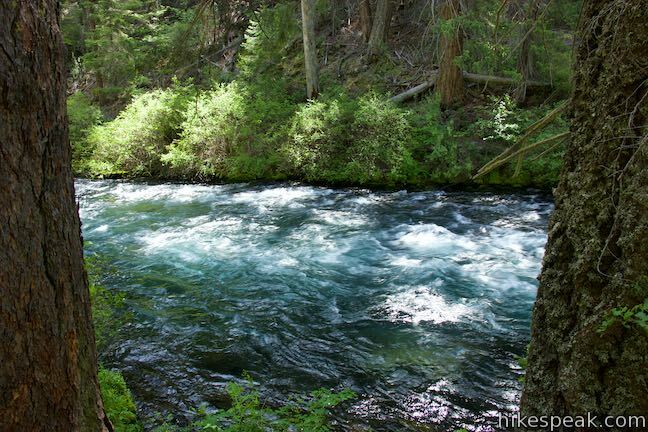 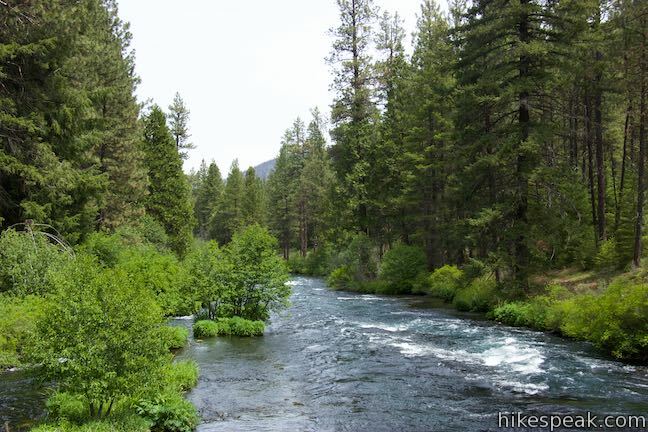 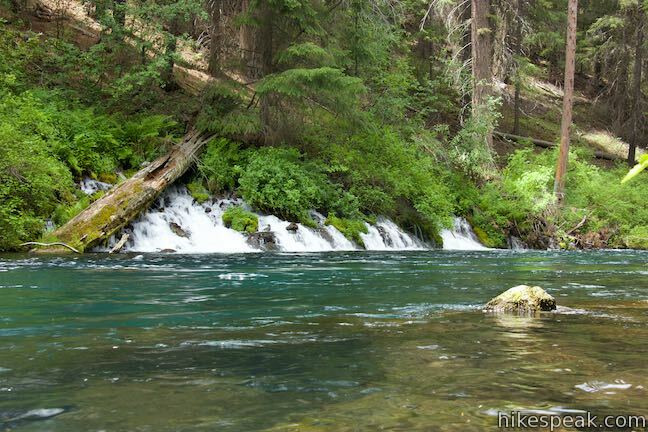 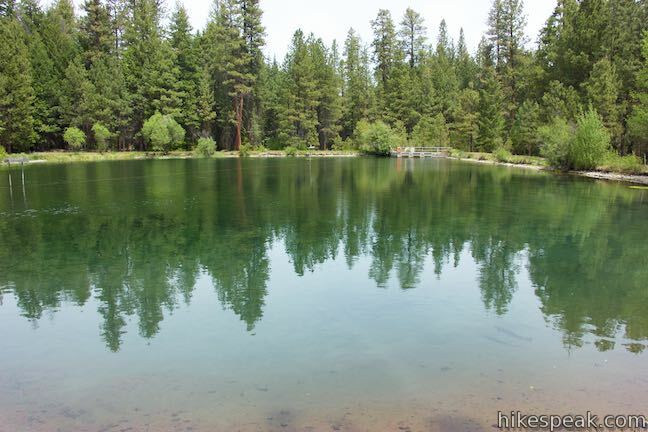 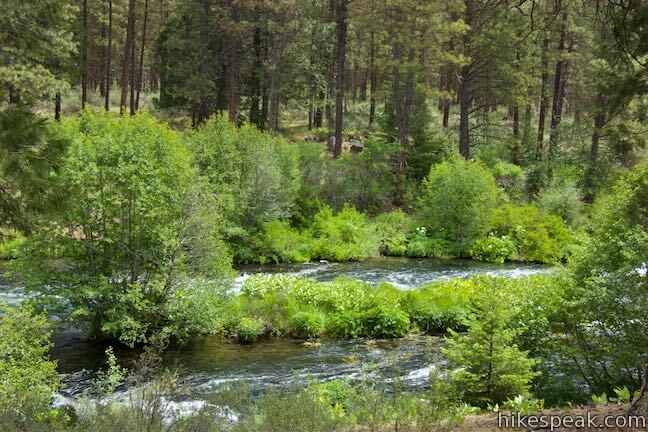 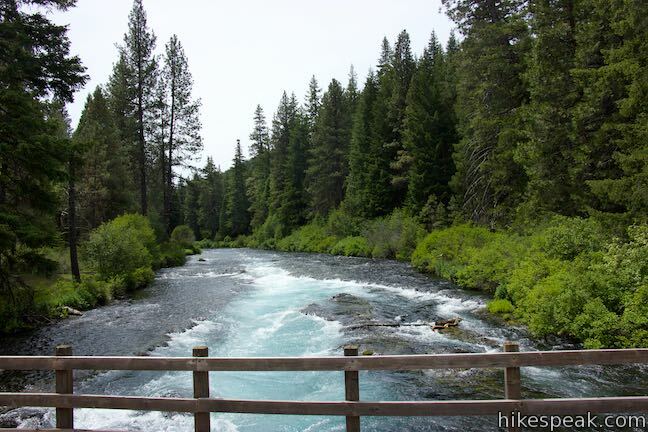 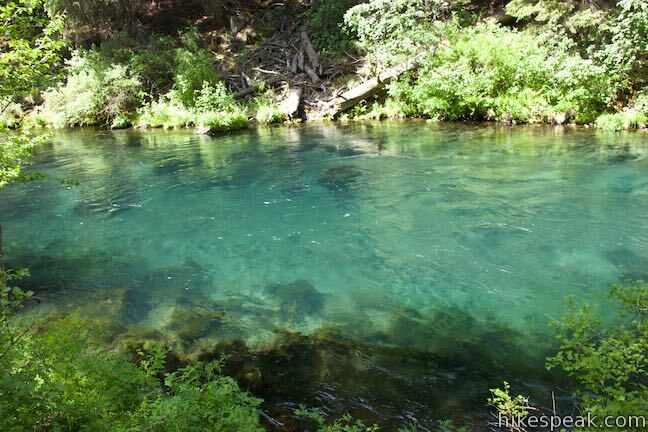 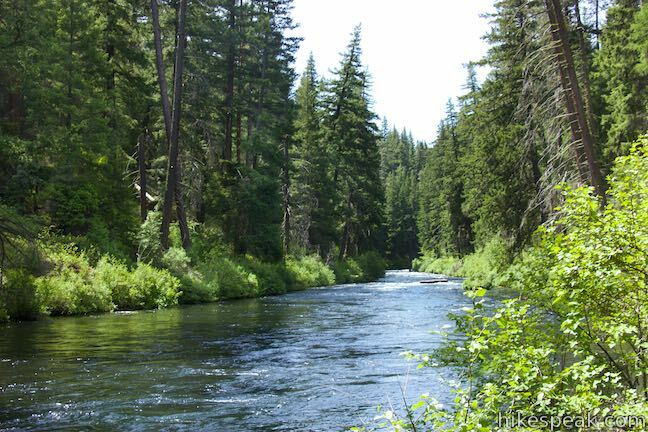 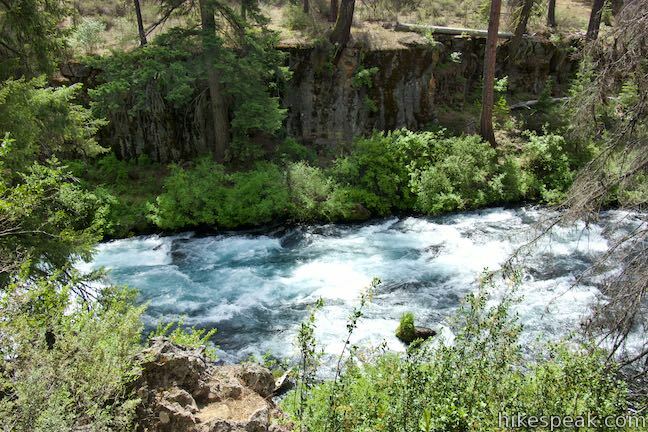 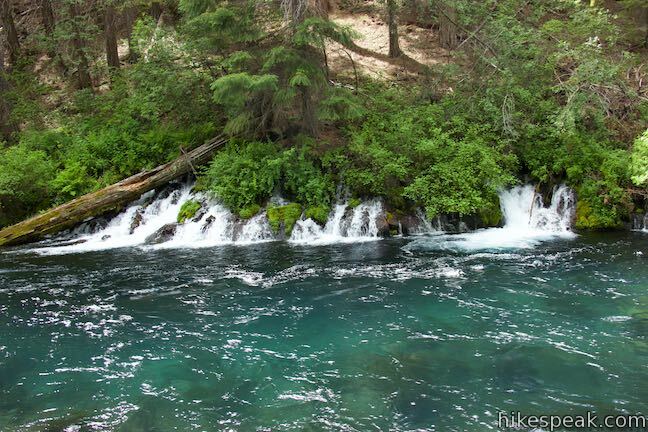 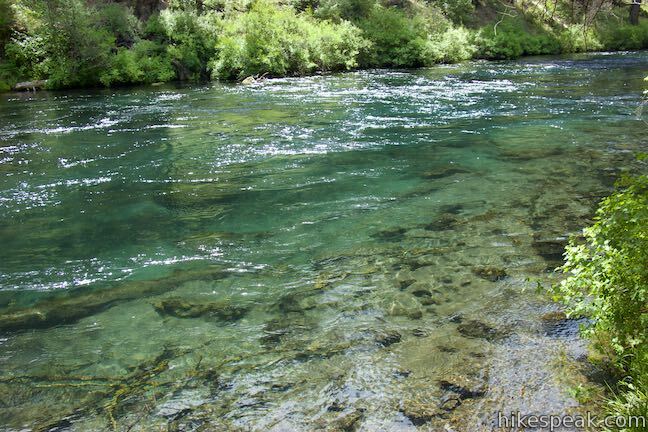 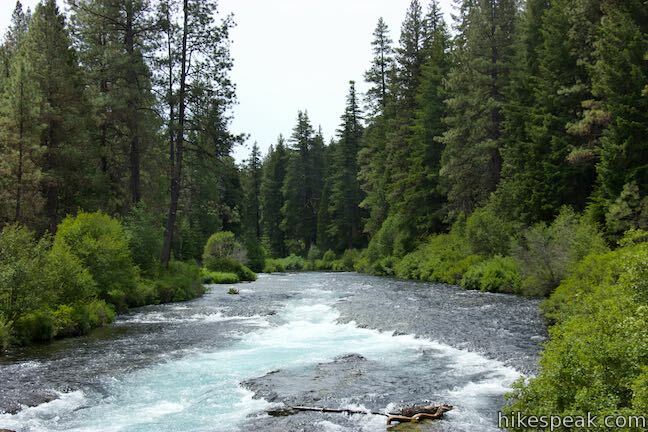 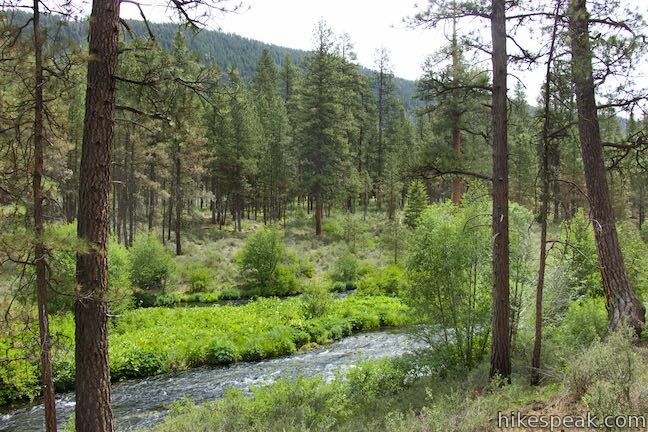 Drive 3.3 miles and turn right at a sign reading “Canyon Creek CG / W. Metolius TR. 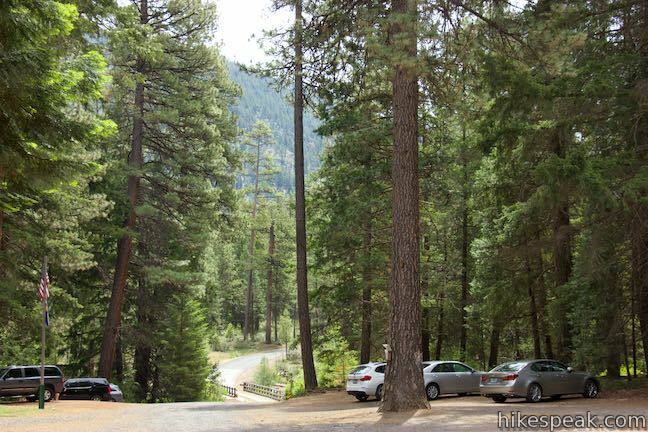 HD.” Drive 3/4 of a mile to a loop at the end of the road within Lower Canyon Creek Campground. 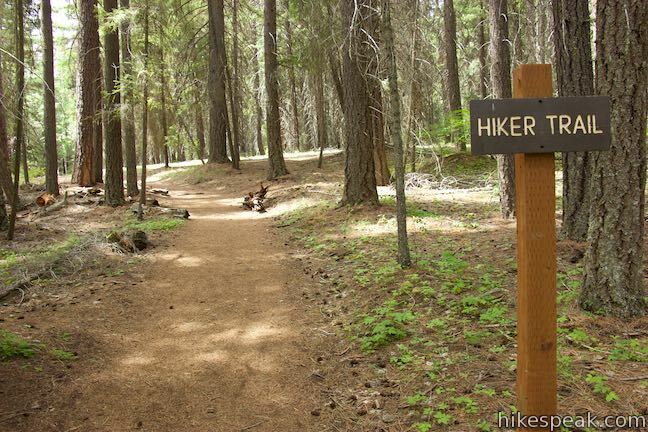 The trail begins from the far end of the loop. 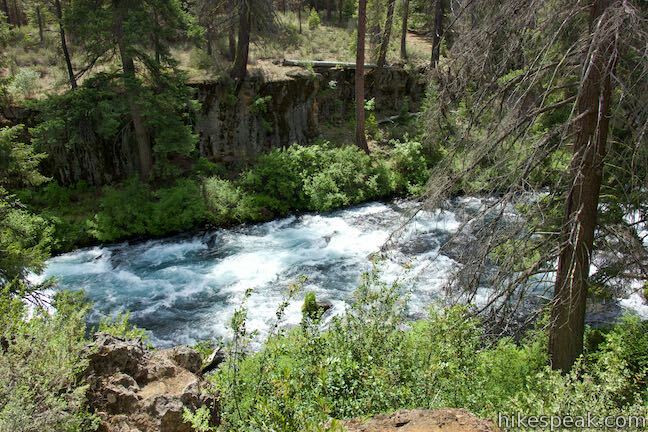 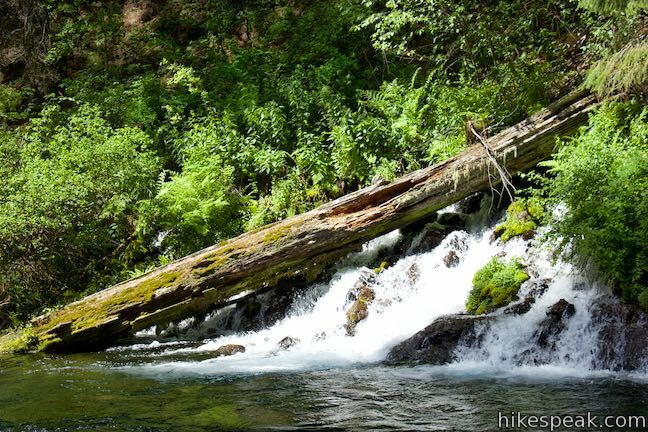 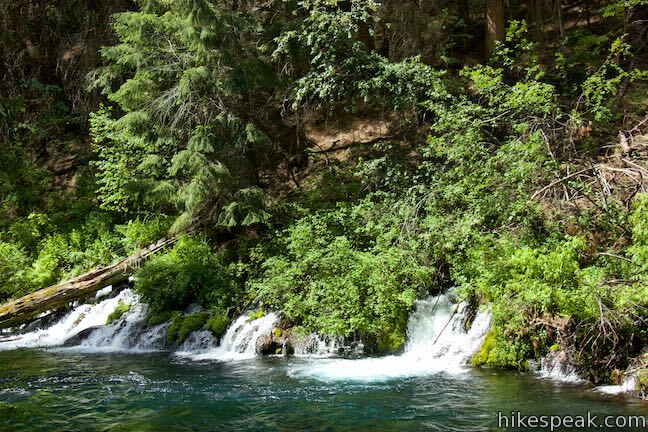 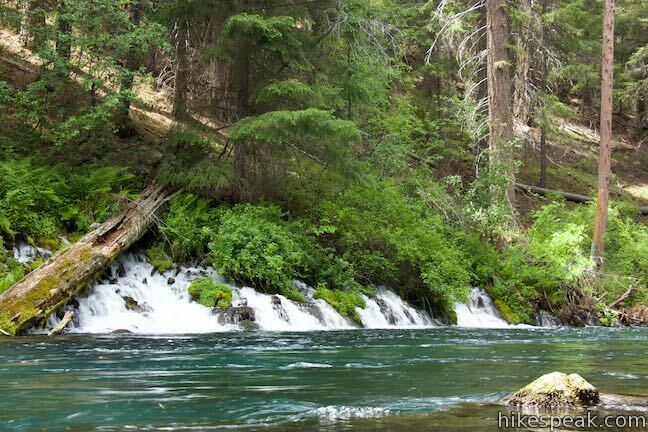 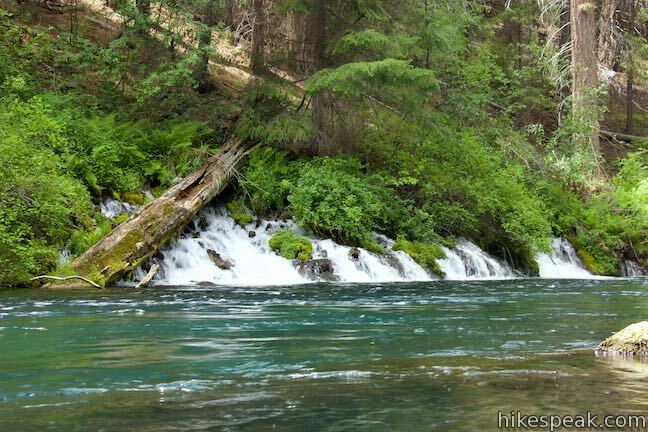 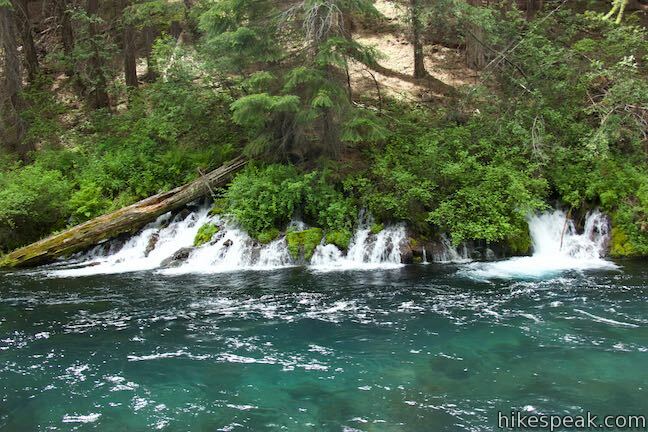 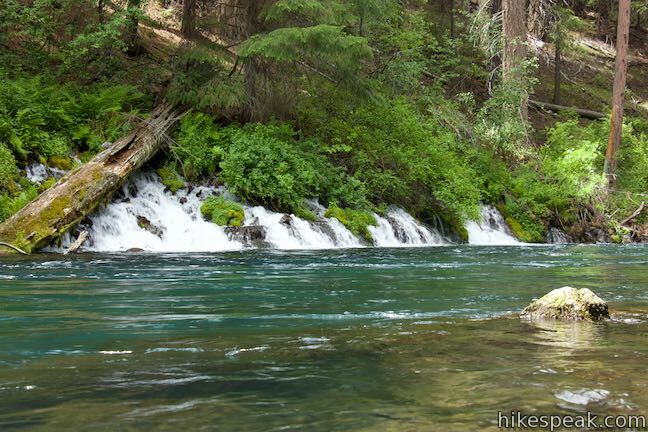 Gushing Springs on the Metolius River by hikespeak.